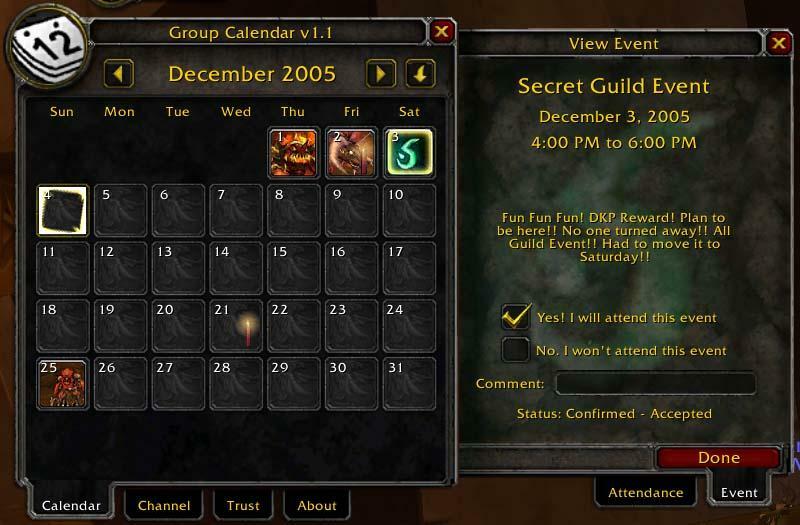 Group Calendar provides an in-game calendar for planning, signing up, and managing events. It can be configured for single-guild use or for multi-guild alliances. ... If you need the download and it isn't available here yet, you can get it from http://wobbleworks.com/groupcalendar instead. Hello Mundocani, I realise this is a very old thread, but we are still using your calendar. 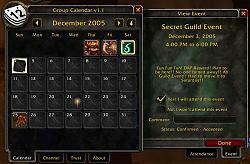 I'm wondering if you have integrated the functionality for the ingame calendar to be displayed on a website? If so where would I find instructions to implement that? The link provided above is redirected to Luminos instead. Last edited by Sparkling : 07-12-18 at 10:23 AM. This is for the PTR and will not work correctly on the live servers. At a minimum, the icons for the new dungeons will be missing, I'm not sure what else might not work if you try to run it on the live servers. So what makes this different from the in game calendar? What benefits do I gain for downloading this? I am maintaining GC4 for the sake of guilds who rely on features it offers which aren't filled by the WoW calendar, in particular support for multi-guild alliances. If you are considering using Group Calendar, you should consider Group Calendar 5 (a separate page here on WoW). It works with the WoW calendar so any member can choose to use it or the built-in calendar, unlike GC4 which requires all members to run GC4. I've created a new project page here on WoWI for "Group Calendar 5 Beta". Once GC5 is final I'll be posting it on this page, but until then you'll find it there. You should post GC5 up here! Half my guild is running the wrong version since it seems you can only get the beta from Curse. I would like to personally thank the author of this add on for re-enabling it. I was really disappointed when I found out that it was no longer going to be able to be used b/c of something with blizzards new UI policy that the author didnt like. As a guild leader and raid leader this add on makes my life so much easier when it comes time to set up and organize raids.......and quite frankly I dislike blizzards sad attempt to make there own in game raid calendar, it is just horrible. I read some of the posts regarding this issue, and I understand your frustration.....if I am understanding it correctly. I myself am a programmer.....well going to college for it actually, so I understand your verve when it comes to programming, I freaking love it and enjoy being able to do it....so from one programmer to another, thank you, and I do appricate your hard work to keep this "must have" add on up and running, my whole guild thanks you!! I know a compliment won't do anything but maybe give you a warm fuzzy, but those of us who use your work and appreciate it are immensely glad that you've returned, even if the outcome wasn't what you were hoping for. You are back ! Thank you, Thank you. Just heard about the demise of GC and wanted to come and take the time just to say THANKS. without this I dont think that I could of organized raids over the last year. It will be hard to continue without the file being available but will see how the game goes, I am a raid addict and play to raid maybe with the demise of this great add I can step away form the game! Thanks Dridzt, I too appreciate all of your support over the years. Few, if any, other users have contributed as much to diagnosing and improving GC as you and your guild have. I hope Blizzard comes to their senses and produces more reasonable addon guidelines, as I'd really love to get back to doing the design and engineering that I love so much. As many have (often rudely) pointed out though, "it's their game". and the debate around it from both addon authors and users. and for sharing it with the rest of us. impressed and appreciative of it even if I didn't get as much mileage out of it. May you enjoy the game without the woes of software support and good luck in your future endeavors. Thank you very much for your time and efforts over the years with your mods. They are some of the "Must Have" mods of the game. I believe (as you stated on a post here or on Outfitter) that you are, indeed, acting out in anger and a bit to quickly. At least, I truly hope so. I hope that you will give thought to some of thoughts given on these threads. This is one of the topics I can see both sides of. Blizzard, while perhaps a bit short sited, is trying to protect itself and its user base as a whole. They are protecting themselves from possible (understandably unlikely) problems with providing a platform for others to make money from. It can lead to an erosion of patent and copyright strength. It can, perhaps, also obligate blizzard to support issues in the future. They are also protecting their players from possible abuse and scams. If I understand things correctly, the author may still ask for donations on their web site, etc. They are simply trying to keep from being directly apparent inside the game (advertised if you will). Blizzard does not want to get into the habit of allowing people to advertise or solicit inside their virtual world. I am not trying to defend blizzard as they are more than capable doing that themselves. I am trying, desperately, to maybe let you see a glimmer of the other side. Trying, selfishly, to get you to reconsider your strong position. Others have said, better than I, how much we, our guilds and friends, use and rely on your mods. I can understand if you are just done with it as a hobby, but stopping at because of this will only hurt your fans and friends. Blizzard will not even notice. Even if we all posted on the forums, the people that see them will be able to do very little to effect policy change. This type of policy would have come from Legal or so far up the food chain it will not change easily. I hope that you take some time to breath and reconsider your actions. Above all, thank you again for your time over the years and reading my post. Take care! Good Hunting. Last edited by chwolfgang : 03-22-09 at 08:34 AM. While I understand your reasoning and I appreciate your time and effort on the behalf of all the players of Warcraft, I will implore you to rethink your stance. Your add-on is one of many that improve the game in such a substantive way that playing without it will represent something of a hardship for us all. Scheduling and populating the Raids in my Guild would be near impossible if it weren't for your hard work. Playing the game would be almost impossible for the average gamer without the likes of Omen, DKP, Auctioneer, PallyPower, BigWigs, etc. Before I log into the game I dutifully check for add-ons that will continue to improve my experience. The developers of a different add-on decided to charge for the full-functionality of their add-on a week or two ago. This decision was the precipitating factor for the Blizzard policy change. While the add-on that changed to a paid program was helpful, it was NOT one of the almost necessary add-ons. What would happen if ALL the developers of the important add-ons decided to charge a fee for their work? The cost of playing the game would double. I know plenty of people who in recent months have let their accounts expire due to the difficult financial times we are going through. If it cost twice as much to play, a lot more people would stop playing. While I disagree with the heavy-handed way in which Blizzard approached this issue, I understand their point of view. They spent millions upon millions to develop a game, and spend millions more maintaining it, while charging less than $15 a month to play. If every add-on developer thought their work was worth $1 a month (which some truly are) we would be paying more to individual software writers who have zero overhead than to Blizzard. I hope that you decide to re-release your work to the public. Withholding it from us hurts us, not Blizzard.